SAN JUAN – Fearing her husband would die waiting for a heart transplant in Miami, Carmen Concepcion started looking for a faster way to save his life, and found the answer in her native Puerto Rico. Pablo, 59, could barely walk from the family room to the bathroom without growing short of breath, Carmen said. In December, Pablo received his heart transplant, becoming the first person to travel from the mainland to the U.S. commonwealth for the procedure, said Dr. Ivan Gonzalez-Cancel, his surgeon and the director of the heart transplant center at the Cardiovascular Center of Puerto Rico and the Caribbean. Pablo is now able to bike about a mile and climb four to five flights of steps. 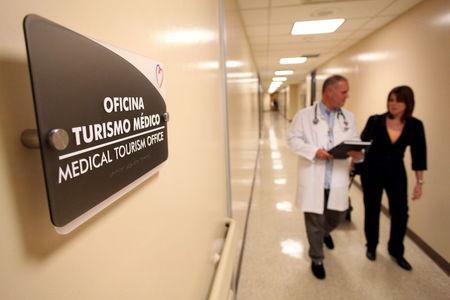 Puerto Rico is trying to build its medical tourism industry, from a current level of about $80 million a year to $300 million by 2017, as part of efforts to heal its chronically sick economy. A component of that is to encourage more patients to travel for organ transplants. Patients who visit for transplants, and for more common medical procedures such as orthopedics, dentistry and weight-loss surgery, spend thousands on hotels, transportation and food. Puerto Rico’s potential as a transplant center is partly based on a macabre statistic – the Caribbean island had a murder and non-negligent manslaughter rate of 19.2 per 100,000 people in 2014 compared to 4.5 per 100,000 in the United States, according to Federal Bureau of Investigation data. High-crime areas certainly exist among the U.S. states, but Puerto Rico has recently also had organ donation rates higher than expected by the Scientific Registry of Transplant Recipients (SRTR), which analyses data on donated organs. The cost of care is another attraction, at as much as 60 percent lower than on the mainland, according to the island government. Because Puerto Rico’s transplant centers are part of the national organ sharing network, U.S. patients can transfer there as long as doctors admit them, with few other hurdles. Pablo and Carmen Concepcion moved temporarily to Puerto Rico, and paid out-of-pocket for Pablo’s transplant and extended hospital stay beforehand. While that cost about $350,000, it was far less than it would have been on the mainland. “I’d rather have a debt and he’s alive,” said Carmen, a teacher. Pablo, who is now disabled, was a truck driver. Finding a heart donor match depends on a number of factors, including blood type, but Puerto Rico’s geographically isolated location within the national organ sharing network can give some patients shorter wait times. The United Network for Organ Sharing (UNOS) allocates hearts based on medical urgency and location of the patients. 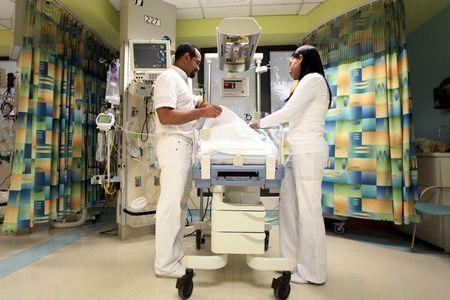 Because there are no U.S. transplant centers within 500 miles (800 km) of Puerto Rico, candidates on the island’s waiting list have the first opportunity at an organ, according to Roger Brown, director of the organ center at the network. Patients on the island from 2009 to mid-2014 waited a median of 1.3 months for a heart transplant, versus 8.1 months nationally, according to the SRTR. For livers, the island had the shortest median wait time in the country at about three weeks, compared to over a year nationally, according to the SRTR. Dr. Juan Del Rio is one surgeon eager to attract more patients. He completed Puerto Rico’s first liver transplant in 2012, after moving to the island from New York because of the greater availability of organs. He originally projected completing around 100 liver transplants a year, but is now doing a little less than half that and he sees attracting people from the mainland United States as one way to achieve full capacity. Surgeons prefer to transplant organs from nearby, but since the late 1980s, more than 60 percent of the approximately 4,000 organs donated in Puerto Rico have been shared off-island, according to UNOS data. Those are organs surgeons would like to use in Puerto Rico. Representatives from Auxilio Mutuo, the hospital that houses the liver and kidney transplant centers, also suggest mainland patients enlist in their kidney program, though the waiting time for a transplant is far longer than for hearts and livers. The island’s government will have spent about $3.3 million on developing the medical tourism industry by mid 2016. Still, some people would be reluctant to travel to the island for such serious surgeries. “People draw the line at cardiology, (saying) ‘I can’t see myself on an operating table in a strange land,” said Josef Woodman, the CEO of Patients Beyond Borders, a medical travel information publisher. Puerto Rico has to show it can offer quality care to compete for heart transplant patients, he said. Island officials say Puerto Rico’s status as a U.S. jurisdiction is an indication of quality. Survival rates for heart transplants match the national figures, while for kidneys, the numbers are slightly higher than nationwide statistics, and for livers, the rates are slightly lower, according to SRTR data. “Over there, it might be super clean, super sanitized, a little bit older, maybe things not as renovated as we have over here,” Carmen Concepcion said of her husband’s care. Gonzalez-Cancel, the heart surgeon, said the island should show it can excel in complicated surgeries like heart transplants to stoke interest in simpler procedures that are the bread and butter of medical tourism. “If you do what is big, then you can do what is small,” he said.